Whole sheet 31.3 by 44.2 cm., 12 ½ by 17 ½ in. 14.9 by 23.2 cm., 5 ¾ by 9 in. King’s auction house was at 38 King St, Covent Garden, London. 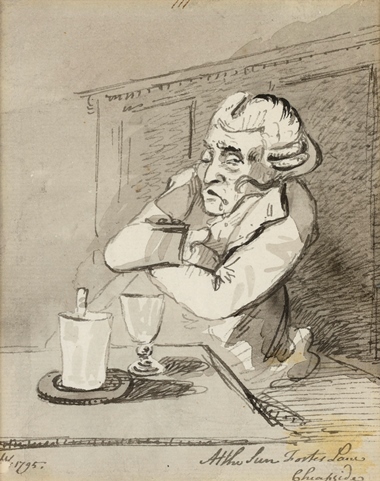 An auction house was started on the site in 1760 by Samuel Paterson who is reputed to have read every book in the English language. He mainly sold books, prints and manuscript as did his successors at 38 King St, King, Collins and Chapman. In 1796, the year before the present drawing was executed, it became King & Son. John Crace Stevens bought into the business in the 1820s and in 1834 it became J.C. Stevens Auction Rooms. It remained on the site until closing in the 1940s. The Ann Street Theatre opened in 1778 and was occupied for its first few seasons by the actor Myron Hamilton and his company. On a 1791 map of Belfast, it is described as the ‘New Playhouse’. It was later demolished at an unknown date. Ann Street is one of the oldest streets in Belfast and runs parallel to High Street - in the eighteenth century it ran between Shambles Street (now William Street South) which is the road disappearing behind the theatre to the right and Queens Bridge. This view is taken from the Corn Market with Ann St to the left. Nixon was an amateur artist who was in business in London with his brother Richard as an Irish merchant. 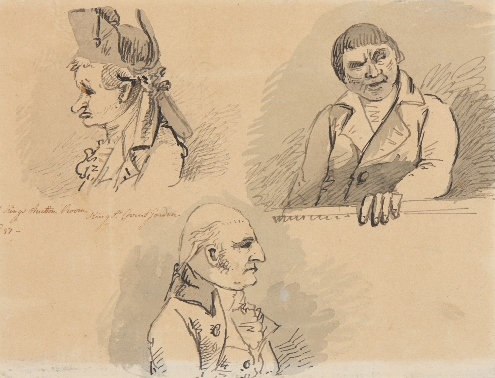 He travelled extensively on sketching tours including several trips to Ireland in the 1780s and 1790s often in the company of other artists such as Francis Grose or Thomas Rowlandson. 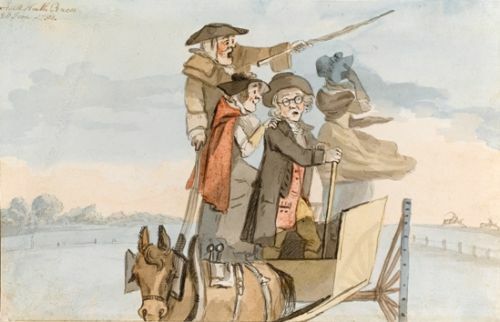 This picture is a later work and clearly shows the influence of Rowlandson under whose tutelage he became ‘a very professional amateur indeed’ (Huon Mallalieu, Dictionary of British Watercolour Artists, 2002, vol. II, p.77). A view of Belfast after Nixon was engraved by George Walker and published in 1797. 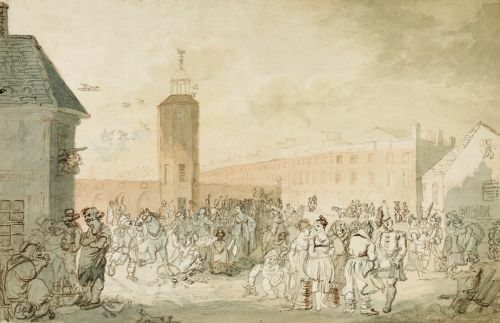 A view of the Linen Hall, Belfast by Nixon, dated 1790, was sold at Christie’s on 14th May 2004, lot 75. The George Inn, visible to the left, is the original pilgrim?s Inn of Glastonbury Abbey. Pevsner described it as ?one of the most sumptuous of the small number of surviving inns before the Reformation.? Beyond is the Parish church of St. John?s dating from the fifteenth century with its tall west tower. 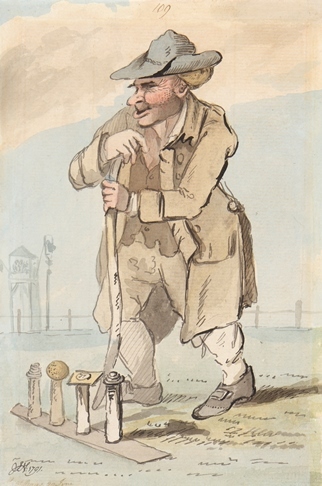 This picture is a later work and clearly shows the influence of Rowlandson under whose tutelage he became ?a very professional amateur indeed? (Huon Mallalieu, Dictionary of British Watercolour Artists, 2002, vol. II, p.77). 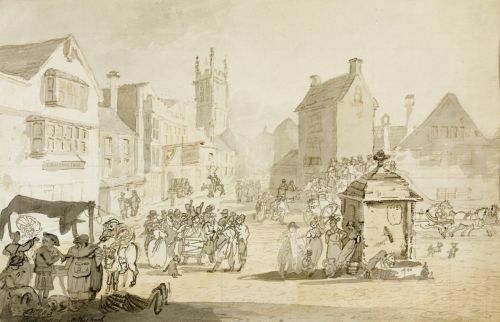 London, Royal Academy, 1812, no.546 as ?The High St at Glastonbury, with a view of the Abbot?s inn, the Conduit, etc.? Tremadoc is an early nineteenth century planned village in North Wales, created by William Madocks M.P. The village was built on land recovered from marshes beside Traeth Mawr in 1800. It stands 4 1/2 miles north-east of Criccieth. Nixon exhibited `Tremadoc, with a view of Taw-yr-Alt, North Wales, the seat of W.A. Madocks MP?at the Royal Academy in 1808, no.334. 186 x 129 mm., 7 ¼ x 5 in. Sir James Mansfield (1734-1821) studied at the Middle Temple from 1755 and was called to the bar in 1758. He was MP for Cambridge University from 1779 to 1784 and Solicitor General from 1780. 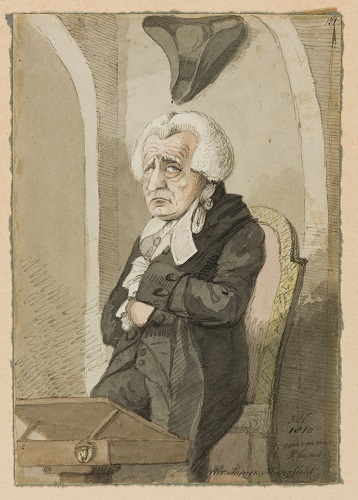 As Chief Justice, he presided over the trial of John Bellingham in 1812 who was accused of the assassination of the Prime Minister Spencer Percival (1762-1812), the only Prime Minster to have been killed while in office. He was shot in the lobby of the Houses of Commons. Bellingham was found guilty and hanged. 15.3 by 12.1 cm., 6 by 4 ¾ in. Foster Lane runs southwards from Gresham Street to Cheapside north-east of St. Paul’s Cathedral. 21 by 14.1 cm., 8 ¼ by 5 ½ in. This is a rare early view of horseracing at Ascot. Racing first took place at Ascot (then called `East Cote') on 11th August 1711 after Queen Anne came across an area of open heath that looked ideal for `horses to gallop at full stretch' while she was out riding near Windsor Castle. The first race was called Her Majesty's Plate over four miles and worth 100 guineas to the winner. 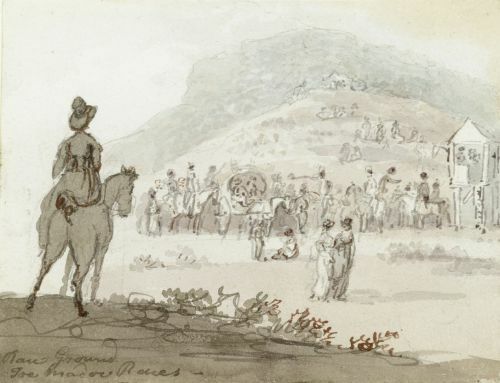 The first four day meeting took place in 1768 but the first permanent stand was not erected until 1794, three years after the present watercolour was drawn. It was called the Royal Stand and held 1,650 people. Another view of Ascot racecourse, dated 28th June 1791 was with Guy Peppiatt Fine Art in 2006 (see Guy Peppiatt Fine Art, 18th and 19th Century Drawings and Watercolours, exhibition catalogue, 2006, no. 9).